Drive for show, and putt for dough. But if you really want to test your full arsenal of shots, try playing a well-designed par 3 course. Augusta National has a pretty one. So does Pine Valley. But good luck getting on either. In the democratic spirit—and to demonstrate that size doesn’t always matter—we give you 12 of the finest public-access short courses in the United States. THE LINKS AT TERRANEA, Rancho Palos Verdes, CA A boomerang. A punchbowl. A “Portuguese Bend.” No, those aren’t items on a hipster cocktail menu. They’re distinctive green designs at Todd Eckenrode’s scenic nine-holer, a family-friendly venue in a scenic locale along the California coast. The Sandbox is a blast -- and also aptly named. THE SANDBOX, Sand Valley Golf Resort, Nekoosa, WI “Take what the land gives you.” Call it the unofficial motto of the Keiser family, the same bunch who brought you Bandon Dunes. What the land has given them at their burgeoning new resort in central Wisconsin is two 18-hole courses, a third in the making and this 17-hole (yes, 17) short course, designed by Bill Coore and Ben Crenshaw. Sandbox is the perfect name for it, given its dune-sy setting and its receptiveness to creative play. THREETOPS, Treetops Resort, Gaylord, MI In the olden days, before the rise of $9 million pay-per-view extravaganzas, golf’s silly season featured quaint entertainments like the ESPN Par-3 Shootout. That dinosaur of an event died in 2006, but the course endures and it’s a gem—a Rick Smith-designed stunner, etched through the piney hills of northern Michigan. The Cradle at Pinehurst Resort. THE CRADLE, Pinehurst Resort, Pinehurst, NC At Pinehurst’s birth, more than a century ago, the property was dubbed the Cradle of American of Golf. From that cradle grew an iconic resort that now boasts 10 courses, including, yes, The Cradle, a stellar Gil Hanse design with nine artful holes ranging in length from 56 to 127 yards. THE MIF ALBRIGHT 9, Corica Park, Alameda, CA There’s a decent chance you’ve heard about the renovated South Course at Corica Park, a big-daddy 18-holer that was recently revived in firm, fast Australian sandbelt-style. Less widely advertised is that Corica also has a fully transformed par-3 course, which is also firm and fast, has rollicking greens and is as fun for beginners as it is challenging for serious sticks. MAGNOLIA GROVE SHORT COURSE, Mobile, AL Pitch-n-putt? Puh-lease. A wedge and putter alone will not suffice at this engaging par-three track on the Robert Trent Jones Golf Trail. We’re talking a layout of full-fledged one-shotters. Expect to face forced carries and tucked pin positions, and bring your deftest touch to negotiate the greens. Angel Park is, by any definition, "very Vegas." CLOUD 9 COURSE AT ANGEL PARK, Las Vegas, NV When you’re on Cloud 9, you’re on a quintessentially Vegas short-course, its 12 holes designed to simulate the challenge of fabled one-shotters around the world, including a postage stamp green, an island green and a “Riviera” green, with a bunker smack-dab in its middle. When the sun goes down, the fun doesn’t stop. Nine of the holes are lit at night. PALM BEACH PAR-3, Palm Beach, FL Set spectacularly between the Atlantic Ocean and the intracoastal, this 18-hole par-3 course was already a stunner when Ray Floyd got his hands on it in 2009. His redesign made it all the better, spicing up the shot values and putting surfaces on holes that range from 81 to 211 yards. TOP OF THE ROCK, Big Cedar Lodge, Branson, MO Giant waterfalls and outsize rock outcrops are not the only reason this immaculately conditioned Jack Nicklaus nine-holer stands out. It’s also the only par 3 course to play host to a PGA Tour or Champions Tour event—the Bass Pro Shops Legends of Golf. Mountain Top is the newer par 3 track at Big Cedar, but it deserves its spot on the list. MOUNTAIN TOP, Big Cedar Lodge, Branson, MO Along with a well-established par 3 by the Golden Bear, Big Cedar has a newer short-course by the Black Knight. Opened in 2017, Gary Player’s 13-holer lives up to its high-elevation billing, stretching some 2,000 yards along a dramatic peak through a landscape ornamented by striking crags and caves. GOLDEN GATE PARK GOLF COURSE, San Francisco, CA Tucked into the sprawling park for which it’s named, this nine-hole track is something of a San Francisco sleeper. 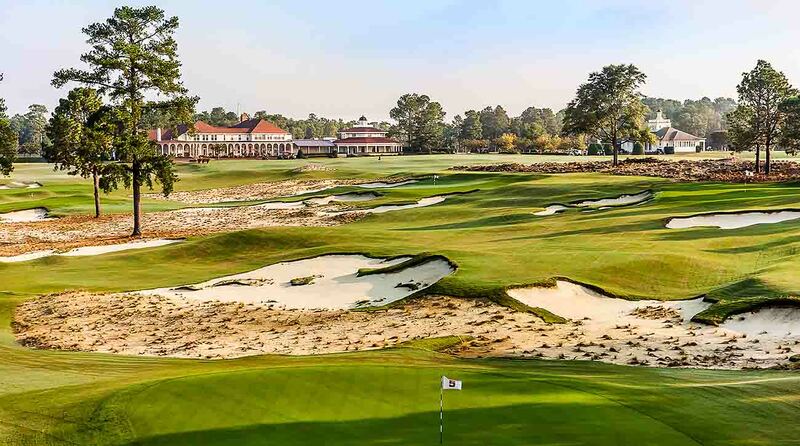 Designed by Alister Mackenzie protege Jack Fleming, it winds through wind-coiffed cypress trees and benefits from the same sandy soil that underpins the nearby Olympic Club. THE PRESERVE, Bandon Dunes, Bandon, OR To architecture buffs, Bill Coore and Ben Crenshaw are best known for such masterpieces of modern minimalism as Sand Hills, Old Sandwich and Streamsong Red. But the duo also do fine work on smaller canvases. Nestled in the bluffs along the Oregon coast, this 13-hole track mingles all the elements of wind-swept links-like golf with Coore-Crenshaw artistry in miniature. Think of it as par-3 golf as it was meant to be. THE SHORT COURSE AT MOUNTAIN SHADOWS, Scottsdale, AZ Once a popular hangout for Hollywood hobnobbers, this high-desert resort also played a role in the 1960s in the TV series “The Brothers Brannagan,” a detective drama. Call off the investigation. There’s no mystery in its appeal to golfers today. The allure lies in this freshly renovated 18-hole par-three course, which rollicks in the shadow of Camelback Mountain. Played from the tips, the layout stretches a mere 2,310 yards, but the vistas and shot values go on and on.